After his death, churches were dedicated to him in France, England, Belgium, Spain, Italy, Switzerland, Germany, Bohemia, Poland and other countries. Pilgrims flocked to his tomb, and in one small town in Bavaria there are records of 4,000 favors granted through Saint Leonard's intercession. Born to the nobility, possibly a prince, and some sources say his father was Saint Judicael. Raised and educated in Brittany, his family running there to escape the Saxons. Monk. Founded Saint Winnow's church in Cornwall, England. Monk at Sithiu (Saint Omer) under abbot Saint Bertin. Founded the monastery, church and hospital of Wormhoult, Belgium, served as abbot, and used it as a base to evangelize the area. Humble, and ever mindful of the apostolic precept "if any would not work, neither should he eat", Winnoc threw himself into the manual labour of the monasteries, doing as much of the tough and disagreeable as any monk in the house. When enfeebled by old age, Winnoc prayed for help to continue his work; he received divine help to work a hand corn mill, making flour for his brothers and the poor. Another monk, out of curiosity, peeped through a crack in the mill-house door to see how the old man did so much work; he was stuck blind for his impertinence, but was healed by Winnoc's intercession. Born to wealthy farmers Heinrich and Hilla Bruso. Though she learned to read, Christina could not write. At the age of five she received a vision of Jesus, and at age ten believed that she became a bride of Christ. When she was 12, the girl's parents arranged a marriage for her, but she ran off to become a Beguine nun in Cologne, Germany; her extravagant piety caused the nuns to question her sanity, and Christina went home where she taken in by the parish priest, Johannes. Throughout her life she and people near her would be tormented by what were considered demonic attacks - she was thrown around the room, her feet stabbed by invisible forces, and similar physical attacks. She received the stigmata in 1268, and it would return each Easter thereafter. In 1288 the mystical experiences ended and Christina spent the rest of her life living as a cloistered Beguine nun. The Swedish Dominican monk, Peter of Dacia, was a long-time correspondent and recorded many of the incidents involving her. Born to a Christian family, his parents were both catechists, and both died as martyrs. Thomas attended a Jesuit school in Arima, Japan, and when he felt a call to religious life, he continued his studies in Macao. 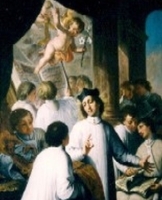 In 1622 he went to Manila, Philippines to study, and there he joined the Augustinians, making his profession in 1624. He studied theology at Cebú, Philippines, and was ordained a priest. Father Thomas returned to Japan in 1631 to minister to Christians during an imperial persecution. Authorities who did not realize his vocation let him visit Christian prisoners, many of whom were missionaries. When the government realized he was conducting a ministry to them, he was forced flee and lived for a while in a cave, the subject of an intense man-hunt. From there, he used disguises, tricks and the name Kintsuba to minister to Christians in the region for years until finally caught, tortured for months, ordered repeatedly to denounce Christianity, and when he would not, he was executed. Martyr. Monk. Bishop of Rennes, France during the 5th and 6th centuries when the Franks were conquering all of Gaul. Nearly eliminated idolatry in his diocese. Close friend and advisor to King Clovis. Required his priests to stop "wandering from cabin to cabin, celebrating Mass on portable altars, accompanied by women who administered the chalice to the faithful." Had a brief conflict with British evangelists who tried to introduce Celtic liturgical forms, confusing the new converts. Played a leading role at the Council of Orleans in 511. Chosen Archbishop of Constantinople in 336. For supporting orthodox Christianity against Arianism, he was exiled to Pontus in 337. He returned in 338, but the Arians again exiled him, this time to Trier, Germany. He returned c.340, but Emperor Constantius clapped him in chains and exiled him to Mesopotamia. He returned in 344 but was exiled to Cukusus, Armenia. To prevent another return he was eventually imprisoned, starved and murdered. He never stopped trying to get to his diocese and tend to his parishioners, but spent most of his time as archbishop in exile. Martyr. Seventh-century priest noted for his severe self-denial, and his ministry to widows, orphans and the homeless poor. Bishop of Lausanne, Kingdom of Burgundy (in modern Switzerland). He re-built and expanded what became the Saint-Maure chapel, supported the construction of the church and monastery in Baulmes, Switzerland, and re-built the cathedral of Lausanne after it had been damaged by invading pagans; he was visiting the workmen cutting timber for the cathedral when he had the accident that killed him. Bishop. Died while returning from a pilgrimage to Rome, Italy where venerated the tombs of the Apostles. Studied under Saint Germanus of Auxerre. Monk under the direction of Saint Cadoc. Founded the influential abbey of Llan-Illtut (Llantwit Major), which housed hundreds of monks, and became home to many Welsh saints. Defended his people against incursions from the north. To relieve famine, he assembled, stocked and led several corn ships to Brittany; in gratitude, some villages and churches there are named for him. Born to a poor but pious farm family. Spiritual student of Saint Israel of Limoges at Dorat, France. Augustinian canon. Ordained a deacon, he considered himself unworthy of the priesthood. Treasurer and sacristan of the churches in Dorat. Had a ministry to the sick and the poor. Teacher and spiritual director of Saint Gauthier. Married. Widower. Monk at Saint Anthony's Monastery on Cyprus. Priest. Hegoumenos (abbot) of Saint Anthony's for 40 years. Reluctant bishop of Khytri, Cyprus for 25 years. When Saracens raided Cyprus and kidnapped local Christians to enslave them, Demetrian obtained their release. Cistercian nun at the convent of the Olive in Morlanwelz, Belgium. Her life in the convent led her to question her vocation, and she became a pilgrim for 15 years after which she received a vision of the Blessed Virgin Mary telling her it was time to return to Cistercian life. Beatrice returned to the convent and spent the rest of her life there, known for her piety and Marian devotion. Born to the nobility, his was a pious family. Priest. Vicar general of Limoges, France. Canon regular at Dorat, France. Taught theology in the diocese seminary. Wrote a lyric biography of Christ. Nursed plague sufferers during an epidemic in 994. Spiritual teacher of Saint Theobald of Dorat. Born to a wealthy family. When his parents died, Alexis became a hermit on the Volga River. His reputation for holiness spread and attracted so many students that he founded a monastery for them, became a monk, and took the name Barlaam. Lay man who was captured and taken to Gaul as a slave. When he regained his freedom he became a hermit near Autun (in modern France). Monk at the Saint Symphorianus Abbey at Autun. Bishop of Barcelona, Spain. Martyred by Arian Visigoths. Mercedarian at the convent of Saint Martin in Perpignan, France. He was noted for his personal piety, hist observance of the Mercedarian rule, and his depth of education. Count of Calw, Swabia (modern Germany). Founded Hirschau Abbey which he entered as a Benedictine monk, and where he eventually served as abbot. Arrested for his faith, he was found dead in prison the day before for his scheduled execution. Cistercian lay brother at the Aulne Abbey in the diocese of Liege, Belgium. A mystic and visionary, known to fall into ecstasies during prayer. Crusader. Captured by Saracens, but miraculously freed. Second bishop of Genoa, Italy, c.400. Spiritual teacher of Saint Syrus of Genoa. 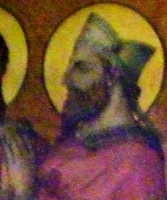 Bishop of Genoa, Italy from c.295. Son of a British prince. Founded a monastery in Brittany, France and served as its first abbot. Seventh century consecrated virgin. Daughter of Saint Edwin of Northumbria. Bishop of Apt, France in 1010. Re-built the cathedral there. Benedictine monk at Fondi, Italy. Held in high regard by Saint Gregory the Great. A church in Cornwall, England is dedicated to this saint, but no information about him has survived. Ten Christians murdered together by Arabs after their seizure of Antioch, Syria. No names or other details about them have come down to us. A group of Christian soldiers who were captured by Saracens invading the area of Gaza in Palestine. When the men continued to profess their Christianity, they were executed. We know the names of some of the martyrs - Himerius, John (2 of them), Kallinikos (Callinoco), Paul, Peter, Stephen and Theodore (2 of them). Thousands of people were murdered in the anti-Catholic persecutions of the Spanish Civil War from 1934 to 1939. I have pages on each of them which you will find scattered along the calendar. Today celebrates the entire group.